Discussion in 'The Backstage' started by Lunacy the Faded, Feb 3, 2019. I have now gigged two different guitars with Type 1 Tronicals for over three years with no failures. I have had to recalibrate one set twice in that time, but the one on my SGJ has been true since initial setup. It is my belief that most "failures" were on the part of users who failed to read and/or heed the user manual. I know, more than one paragraph, it's too much commitment for most guitarists. According to a tech at Tronical most of the trouble they've seen is from guitarists galling the gears by using a tuner crank to wind strings instead of just pushing the up button. arcticsg and Lunacy the Faded like this. I've heard both good and bad things about the robotuners, some said it went haywire on stage, some said it never worked right out of the box. That's all hear-say though, I have no actual proof. But in response to the tech at Tronical: They blame the user when the real problem is that it was a poorly designed system that would not allow user intervention without mucking about with the system. Go back and design it again. To me, this screams of the arrogance that accompanies German "tech" sometimes (I have a lot of experience in this particular area): They make something a certain way because "this is how it should be" in their minds, and "it's convenient, the user does not need to touch it". That's great for washing machines, dishwashers and some cars, but they never think of the end-user themselves and maybe they will want to touch it for x or z reason. That's all hear-say though, I have no actual proof. But you're very happy to spread it around, right? 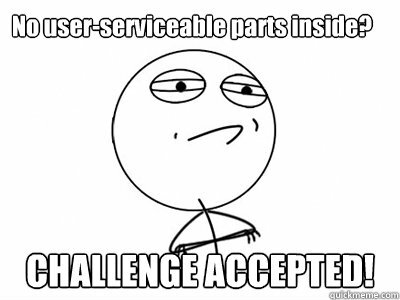 When that user does something specifically mentioned as likely to cause damage in the user manual the user is at fault. "Arrogance" is thinking one knows more than the manufacturer and ignoring their instructions, then crying foul when one breaks the product due to one's own laxity. Using plastic in the gears seems like a poor materials choice on their part, seems to me. Wow. Haven't had enough coffee yet this morning or something? "Spread it around"? Before painting me with your tar brush, I highly recommend you go re-read what I wrote above before cherry-picking texts from my posts to suit your mood, especially the beginning part, and then you can apologize. If it broke because someone tuned it manually, it means the company did NOT do their research into how musicians use instruments. So, it was/is a bad product from that standpoint. And yes, trying to force something down someone's throat like that is "Arrogance", especially if they didn't do the research. Just like the previous Gibson CEO did with the 2015 range. Sorry your feelings are hurt though I have no idea why. And both things you mention are bad, so your uninformed opinion is obvious. Since you have neither experience or other proof of these claims, you are spreading rumors on an internationally read forum. guitarists galling the gears by using a tuner crank to wind strings instead of just pushing the up button. No, not because they tuned it manually, because they used a crank to speed wind it, which if they had read the easy start intro in the user manual they should have known not to. @Biddlin You're picking gnat shite out of pepper with your arguments. What's the matter, too arrogant to apologize when someone calls you on your bull ? Back to the CEO, I am really happy with the new "contemporary line up" flagship product the DC tribute. I got this one back in September so early it has PROTO written inside the route. It was the floor model from Sweetwater so I expected a good example and sure as heck, Proto is GREAT! I just might buy a new Gibson every September if they can mill something out like these. fos1, Thumpalumpacus and Biddlin like this. From what's coming down the pipeline, let's say I'm more than excited. I work at a Gibson dealer, and I am beyond stoked for the new lineup. All the stuff from the 2019 lineup we've gotten so far has so much better craftsmanship than the Henry era stuff. We've had to send back less Gibsons because of that. Right now they're on a hiatus with ordering because of redoing the factory for the new lineup. All I can say is, I'm happy with my Blonde 2019 model 335. Only thing I don't like about it is how to date it; it says 2018 on the back of the head and 2019 in the f hole! fos1 and Lunacy the Faded like this. Oooh.. that Fender on the right looks delicious! Your comment on German engineering reminds me of the cup holders in BMWs. Years back I drove an old BMW and the cup holders had this design that was only suitable for a very specifically shaped cup which had a small botton with a larger middle. Hence it had to sections, a small circular area in the bottom and then a wider one on the top. If you tried to put any other beverage, like say a can of soda, in it you would find that it was too large for the recess in the bottom but too small for the larger one it was forced to sit in. This it would slide around and slosh liquid around. People complained about this for years before I had one and they were still complaining when I got rid of it. My understanding is that BMWs position was "this auto is meant for driving, not drinking in". In other words "this car suits our purpose, not yours". Thanks BMW, for putting the customer last! I do think they finally gave in though some years back. Hector and Lunacy the Faded like this. Still no Christmas present found? Save twice now with Tronical Gift Card! It invited me to take part in a promotional offer. An offer that runs until 24th December 2018.